The Parish Hall was originally a prefabricated iron store made by Edwin Maw of Liverpool erected in 1854. The present stone façade was added in 1872 when it became the Rechabite Hall. In 1881 it was acquired by the Wesleyan Church. It is believed to be the only prefabricated iron building brought to Melbourne at the height of the Gold Rushes which still stands on its original site. 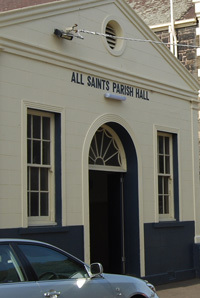 The Hall is primarily used by the parishioners of All Saints Church, Fitzroy and Sacred Heart School, Fitzroy. However, in July 2008, the Archbishop of Melbourne, Denis Hart, made provision for the Parish Hall to be renovated and refurbished in order to expand its use for the recently arrived Catholic Sudanese people to Melbourne. As a result of this, All Saints Parish Hall now houses the Community Centre for the Australian South Sudanese Community Elders' Council Inc. It was blessed on 26th July 2008 by His Eminence Gabriel Cardinal Zubeir Wako, Archbishop of Khartoum and opened by The Hon. Lindsay Tanner, Federal Member for Melbourne and Minister of Finance and Deregulation. Under the auspices of the Catholic Archdiocese of Melbourne, the intention is "...that all who visit this place may learn here to hope for the coming of God's Kingdom." For further information, please contact the Secretary on 03 9419 4349.